'94 964 C2 Coupe. Just serviced. Midnight/Tan. CA Car.! 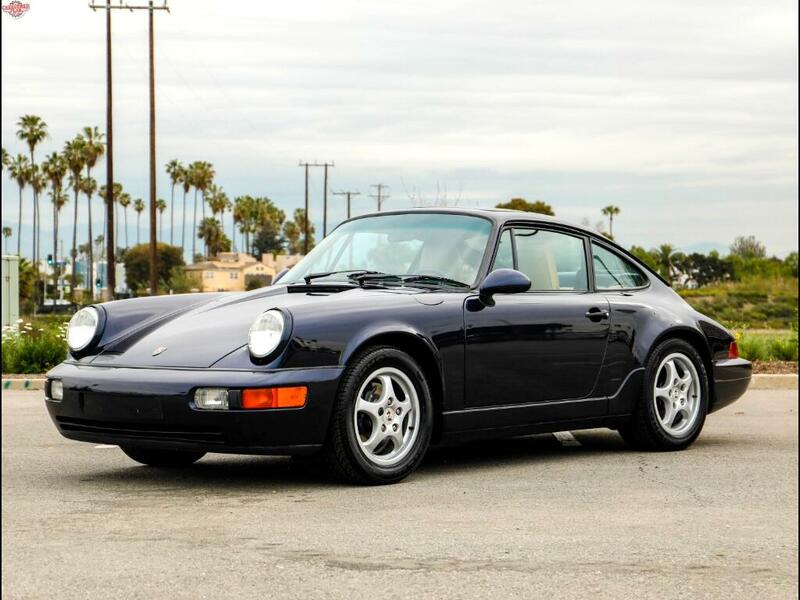 Chequered Flag International is pleased to offer this 1994 Porsche 964 C2 Coupe in Midnight Blue with Tan interior. 136,903 miles with clean Carfax. This 964 was sold new in California and lived here ever since. The body is straight with no sign of prior damage. Paint is overall bright but driver quality. The interior is good throughout. No rips or tears on the seats, no dash cracks, all electronics working, etc. Mechanically, just had a thorough check out and service including: Changing oil & fuel/oil/air filters, plugs, belts, brake and clutch fluids, clutch master cylinder, brake hoses, oil return tubes, oil tank hoses, valve adjustment, valve cover gaskets, front shock bump stops, A/C overhaul with new evaporator, expansion valve, etc. Plus we did compression and leak down tests. Retail cost around $8k P&L. The engine is very strong. Smooth shifting transmission, good clutch and syncros with responsive steering and brakes. Comes with its tools, handbook, some records and both keys. '94 is the last and by far the rarest of the 964's with only around 140 5-speed U.S.-model narrow body (non RSA) coupes built. Inspections encouraged. Inspections encouraged. All sales AS-IS. Sales tax and license fees due if delivered in California. Message: Thought you might be interested in this 1994 Porsche 964.